Dr. Kofi started his journey in Kumasi, Ghana, where he was born and raised under a great African tribe–known today as the Ashanti tribe. In our interview, he tells me that his first influence of wanting to become a doctor came from his father: Dr. Yiadom Sefa-Boakye. Dr. Yiadom was not only a well-known doctor in Kumasi but an entrepreneur, philanthropist, and even a chief–Dr. Kofi even recalls a time when businessmen would frequent his house for his father’s advice on lumber and other important policy issues. Unfortunately, Dr. Yiadom did not live long enough to see the many accomplishments that Dr. Kofi has achieved today, however, Dr. Kofi is still thankful that he was able to work under him; so he can see just how his father healed his community through medicine. And so at the tender age of 17, with the help of his family, he bought a one way ticket to America and worked his way up to become the proud doctor that he is today. The greatest takeaway from our interview is his joy of seeing the smiling faces of patients in the delivery room–and how they constantly thank him at every place he goes whether be at the grocery store or at reggae concerts. 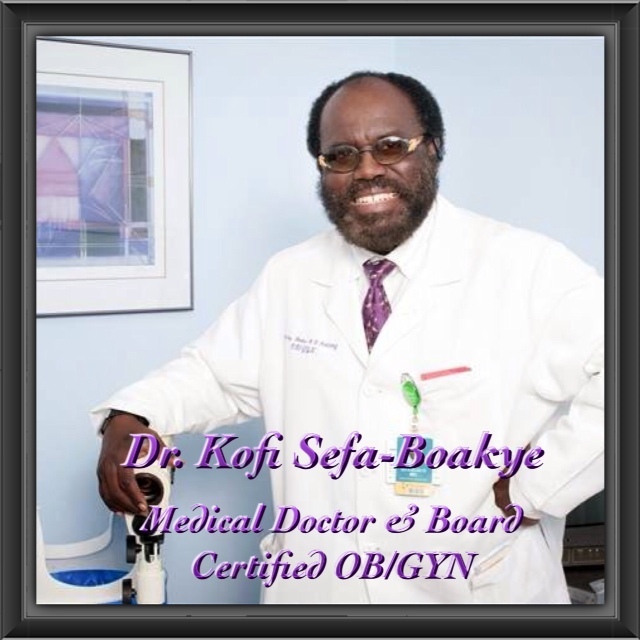 Every day he considers his profession as a hobby and never “work.” Dr. Kofi sometimes wishes that he can pay his patients for the pleasure that he derives from bringing new life into this world. He tells me, and to aspiring doctors out there, that “once you get out of Medical School, you really have to look deep inside yourself and find what it is that makes you happy and what brings the most positive impact to other folks.” And so the choice of him bringing life into this world was logical. Today he lives in San Diego, Ca, where he resides with his wife Elizabeth, and has three active clinics. He has delivered over 15,000 babies to date and his most prized deliveries are his three sons, which brings him pride each and every day: Prince Asare, Prince Asante, and Prince Afriyie (Kojo).